When it’s midsummer and the Big Blowtorch In The Sky is set to welding temperature, the very idea of cooking can be daunting. I, who usually delight in knocking together a multicourse meal, find things to love about take-out food, or failing that, going out for a meal of something cool and fresh with just a little tang of spice. Salads look delicious, sushi is marvelous, and I’m likely to develop a craving for a Hawaiian marinated tuna called poke. In case you haven’t heard of that before, it’s pronounced “pokey” and in its simplest form is a mix of chunks of ahi tuna marinated with various condiments, usually including sea salt, seaweed, a dash of sesame oil, and chopped onion or scallion. Every family has their own recipe, and there’s a lot of room for improvisation. Lots of local restaurants serve poke at least occasionally, but one – the aptly named Jus’ Poke in Redondo – is a specialist, offering up to six kinds every day, including one with tofu instead of fish. The little restaurant at the side of PCH has been open for a few months, in an odd triangular building that was formerly a doughnut shop and Chinese take-out. The small space is brightly painted and welcoming, and there are four tables inside and several more outside under the trees in a space that is surprisingly pleasant. Ordering is pretty simple since the menu is short: decide which variant of poke you want, whether it will be served plain or over rice with a side dish, and you’re done. The six types of poke are “original,” spicy, Cali Roll, wasabi, shoyu, and tofu. On my first visit I dined outside with a friend, and we sampled the spicy and shoyu. The spicy was made with a chili pepper laden sauce, sweet and green onions, and a type of feathery, crunchy seaweed called ogo that appears in almost everything served here. Those chilies were assertive, and while I liked the sensations of cool and heat and onion sharpness, my friend could only eat a few bites before overdosing. She preferred the shoyu – same as the spicy, but with soy sauce instead of chili – though she found it a bit salty. Soy sauce is salty but also refreshing on a hot day, and I thought it was just fine. On a blazing afternoon I went back for more – for take-out this time, as I had friends coming over and it seemed like the perfect thing to welcome someone with after a long drive in a hot car. We got everything but the California roll style, and it only took decanting the pint containers into bowls and handing out forks to get the party started. The restaurant had been out of the original, simple version on my previous visit, so this was my first chance to try it. This is the one where you taste the fish most subtly adorned, a breath of herbs, onion, and seaweed enhancing the flavor. I like several of the other variants, but this is the one I will get every time. The wasabi and the tofu are tied for my second favorite – which surprised me, because I liked the spicy and shoyu versions when I first had them. The spicy was indeed good for a big blast of heat, but the relatively mild wasabi paired better with the fish. As for the tofu, it was the original recipe with tofu rather than fish, and everyone at the table remarked on how well it worked. If I bought some of the spicy or wasabi poke to put out at a party – and I’m likely to now that I have tasted it – I’d have this as a light, refreshing antidote. Jus’ Poke does sell a few other items, and I had to get one island favorite – spam musubi. It’s spam sushi, a weirdly enjoyable item made with a slice of grilled spam wrapped in lightly vinegared rice and a sheet of seaweed. In Hawaii this is a cheap, portable workman’s snack, and it’s the taste of home for expatriates. I usually find spam disgusting, a hypersalty mystery meat, but something about the vinegared rice and seaweed adds just enough balance so that I like to eat it every year or so. Hawaiian sodas and desserts are offered, including coconut pineapple or green tea ice cream, but I didn’t have any on either visit. I was there for the fish, and I got what I was looking for. The bowls of poke with white or brown rice run $9.50, and if you just get the fish as I did a half-pound is ten bucks and is filling enough for a healthy appetite. I recommend you pick up several different kinds and try them – it’s a fun, refreshing, and healthy way to beat the heat. 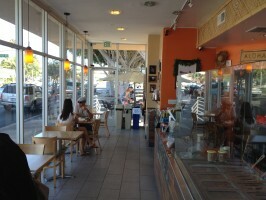 Jus’ Poke is at 501 North PCH in Redondo. Open daily except Tuesday opening at 11 am – close daily at 8 pm except Sunday at 7 pm. No alcohol served, parking lot. Menu at juspoke.com, phone 310-379-1133.